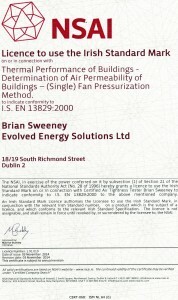 We are very pleased to announce that Brian Sweeney, owner of Evolved Energy Solutions LTD has been granted a license to use the Irish Standard Mark in connection with ” Thermal performance of Buildings – Determination of Air Permeability of Buildings Method -(single) Fan Pressurization Method” I.S.EN 13829:2000. We are delighted to be one of just two companies (at the time of writing) located in Co.Dublin to be accredited to test new buildings and provide test results which can be used in the DEAP calculation procedure. Click on the image below to be brought to our contacts page if you would like to discuss any new build projects where testing may be required. 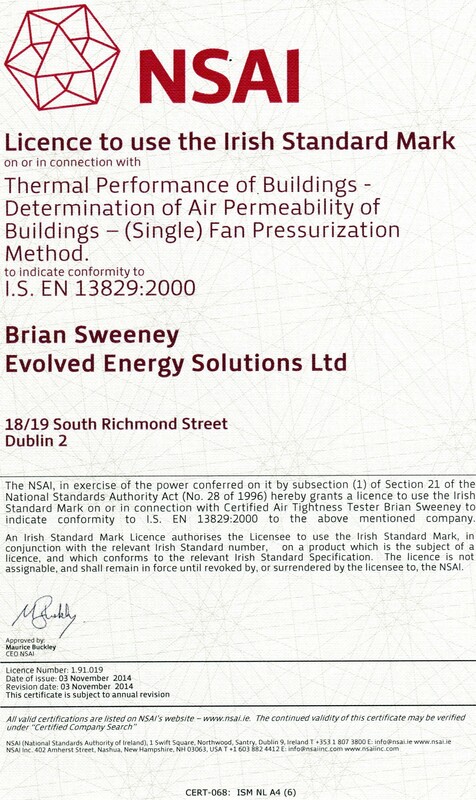 Brian Sweeney of Evolved Energy Solutions Ltd is Licenced to use the Irish Standard Mark in connection with “Thermal performance of buildings-Determination of Air Permeability of Buildings-( single) Fan Pressurization Method to indicate conformity to I.S. 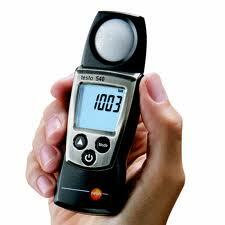 EN 13829:2000. Evolved Energy Solutions recently provided an energy audit of a commercial premises in Dublin. The clients were down sizing one aspect of their manufacturing business while increasing their retail space. This is a common story for many businesses in Ireland today. 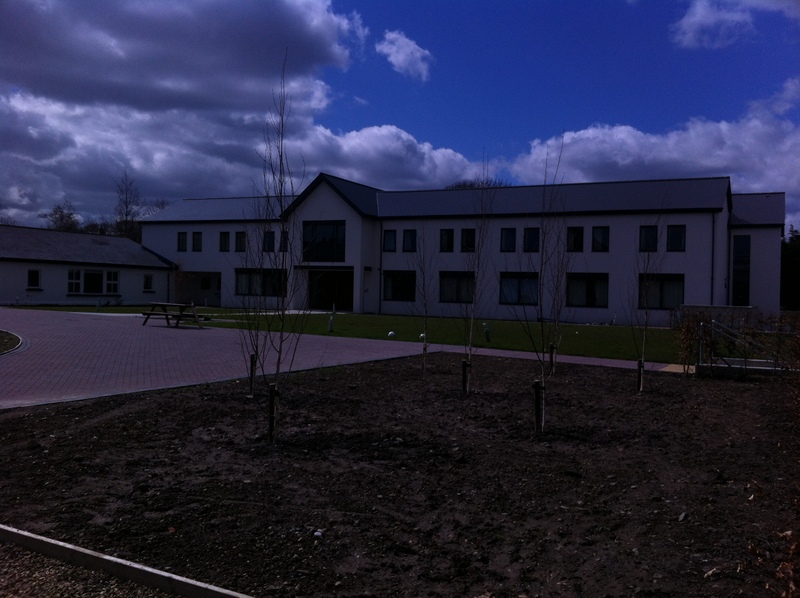 One of the key areas of energy saving we focused on was their existing lighting units. The device shown above is a Lux meter which we use during an energy audit to measure the lighting levels in various areas of a building. There are Lux level guidance figures available from CIBSE depending on the task being undertaken. Lighting colour and render are also important factors to consider before suggesting to a client if they can make any potential energy savings. Lighting has a dramatic impact on occupiers of a building and decisions to change lighting levels should not be based on energy savings alone. 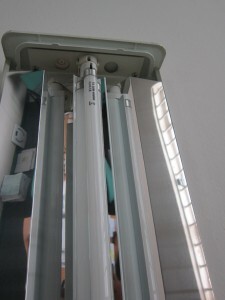 In the factory area of the building there were a significant number of lighting units that were surplus to requirements due to the change in activity and occupancy. 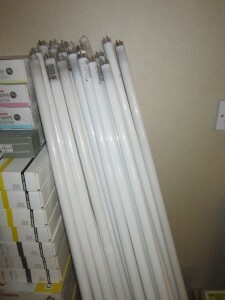 The lighting levels were dropped from in excess of 1,480Lux right down to 300 Lux through the removal of excess bulbs from suitably located fixtures around the building. 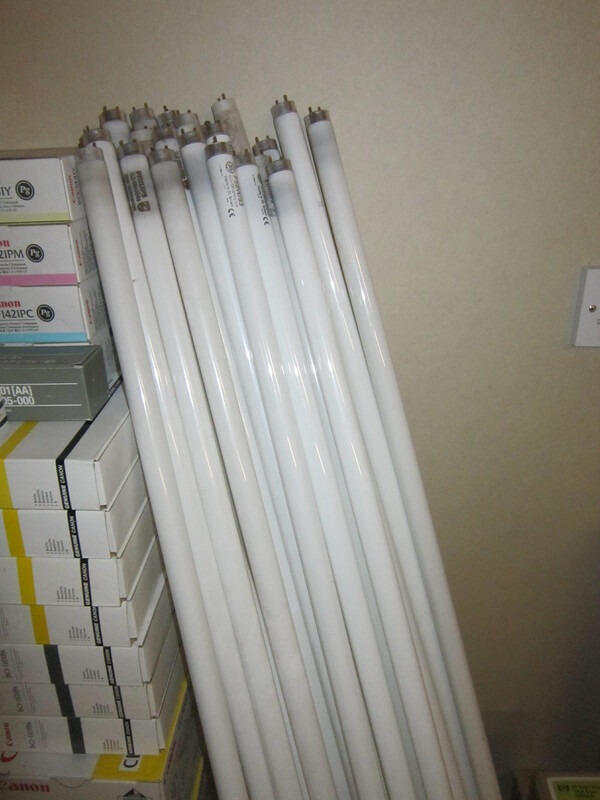 It is important a work environment remains safe and suitably lit at all times and we do not recommend taking bulbs out without checking the levels before and after. Delamping is a term used to described removing lighting fixtures or bulbs that are no longer required. For example in the property we surveyed the factory floor has changed use from a very detailed trade and process action to one of storage and filing. 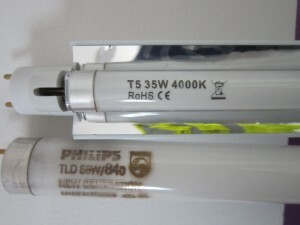 The levels of light needed to carry out a desk bound task to one of picking a labeled item from a shelf are far apart in lighting requirements. The Delamping process in the factory allowed for the safe removal of 15 x 2 x 5ft T8 Florescent bulbs which were operating for a total of 10 hours each day. Removing these 30 bulbs should save the client in the region of €845 each year based on the current occupancy rates of the building. 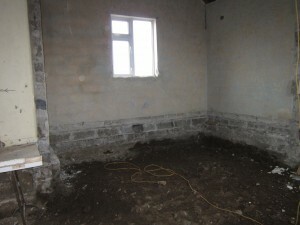 The cost to the client was less than €100 in time from their maintenance company. Delamping is essentially a zero cost strategy with low risks associated once a little bit of common sense is used before implementing. We decided on a low cost, simple to implement energy efficient bulb replacement upgrade option for the client in question. The decision was taken to upgrade their existing T8 Light fitting located in the offices and factory floor with a T5 adaptor bulb. 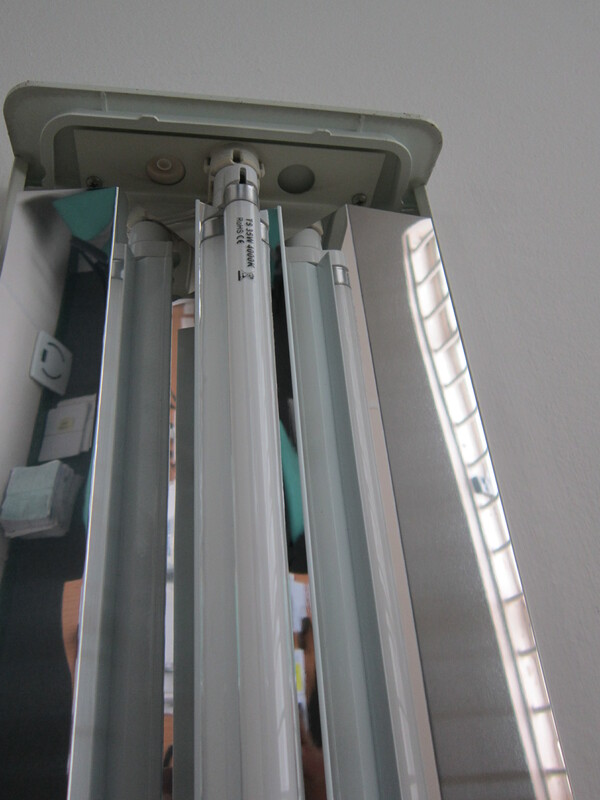 Essentially this simple to install method of changing a light bulb reduces the energy demand by 50% without the need for any expensive fixture replacements. The lighting levels were checked using our Lux Level meter and we found only a marginal reduction in lighting levels less than 8% which did not affect the task being performed in the office or factory areas. The bulbs have a reflective attachment making them suitably sized replacements for older T8 units. If our clients are planning on occupying their building for more than a 2-year period we may suggest a number of lighting control and fitting upgrades such as those outlined in the simple diagram above. Occupancy sensors are a fantastic method of automating energy saving practices and eliminating the possibility of leaving lights on in areas of the property that are rarely used by others. Earlier this month Evolved Energy Solutions attended a demonstration morning in the building above to review a mechanical heating and power system commonly referred to as a Micro Combined Heat and Power (CHP) unit. Developed and manufactured by German company Senertec GmbH, the Dachs is a European manufactured packaged micro CHP unit based on reciprocating engine technology. The Irish agent and man in charge of the demonstration morning was Mr Frank Daley of Kinviro http://www.kinviro.com/?page_id=7. Frank has installed in excess of 65 units in Ireland and offers a very professional approach to how these units can and should be installed. We felt his answers on the systems pros and cons were very transparent and open. Like most renewable or low energy systems a CHP unit must be installed in the right building, with the right client or savings are unlikely to be achieved. The Dachs system is apparently the most popular micro CHP in Ireland, and has been successfully installed in numerous applications such as nursing homes, fire stations, hotels, office blocks and warehouses. The “rule of thumb” guidance with these systems is to ensure you size the machine of your thermal base load. Your thermal base load is the minimum amount of thermal energy that your building is likely to need at any given time. The electrical load of the property should also be considered, for example it is vitally important you implement all your electrical energy saving/reductions at your property prior to installing a CHP or you may end up with an over sized system which exports energy onto the national grid without earning you a cent. 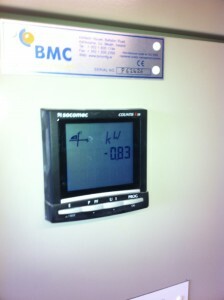 We witnessed the unit in operation reversing the electrical consumption of the property from 5kWh to negative .83kWh. 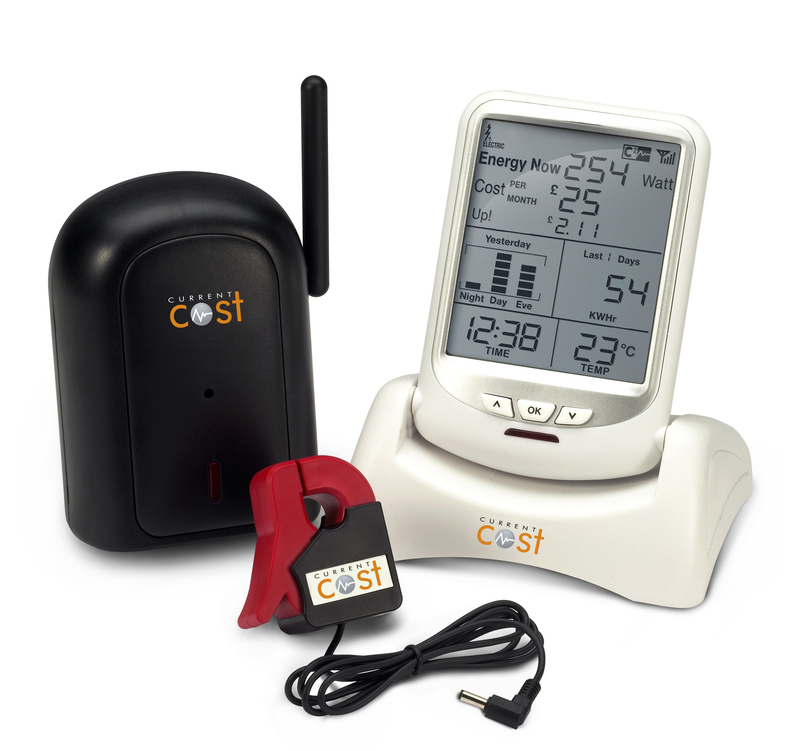 In the case of the system we reviewed the magic base line figure is in the region of 5kWh. The system used natural gas as a fuel source and can produce 5 kWh of electricity and 12.5kWh thermal at a lower price than you can purchase it from your energy supplier. The heat generated by producing this low cost electricity can then be used to provide up to 12.5 kWh of heating energy as an added bonus. The result could achieve an estimated energy saving in the region of €3,500-€4,000 per year in the right application. With an installation cost in the region of €22,000 this should equate to a ROI in approx 5-6 years. These figures add up when you consider the life expectancy of the unit is in excess of 80,000 hrs once it is maintained correctly. If you are interested in the applications of a Micro CHP unit or feel it may be of benefit to your building and would like an impartial survey carried out on your behalf please feel free to contact Evolved Energy Solutions at any time. Our feeling on the subject, like most other energy saving options on the market, is that the correct unit in the correct building should lead to a successful outcome. 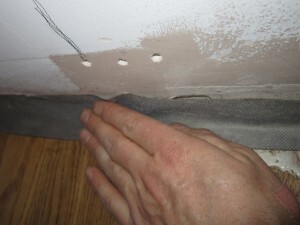 If you are living in a drafty property and would like to tackle the job of improving the air tightness levels around skirting boards or behind wardrobes and kitchen units then here is a simple guide to achieving long lasting results. You need very basic DIY skills and the correct equipment to tackle this kind of work and we suggest carrying it out prior to redecorating !! GLOVES! !, plastic bag for rubbish and a damp cloth. 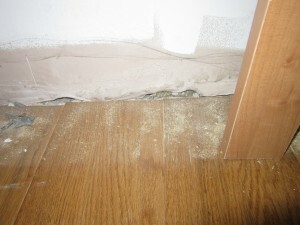 The image above illustrates the gap between the plasterboard wall and floor covering with the skirting board removed. 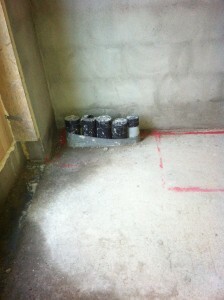 This is a really common problem in Irish construction that allows excessive cold air to enter your property. 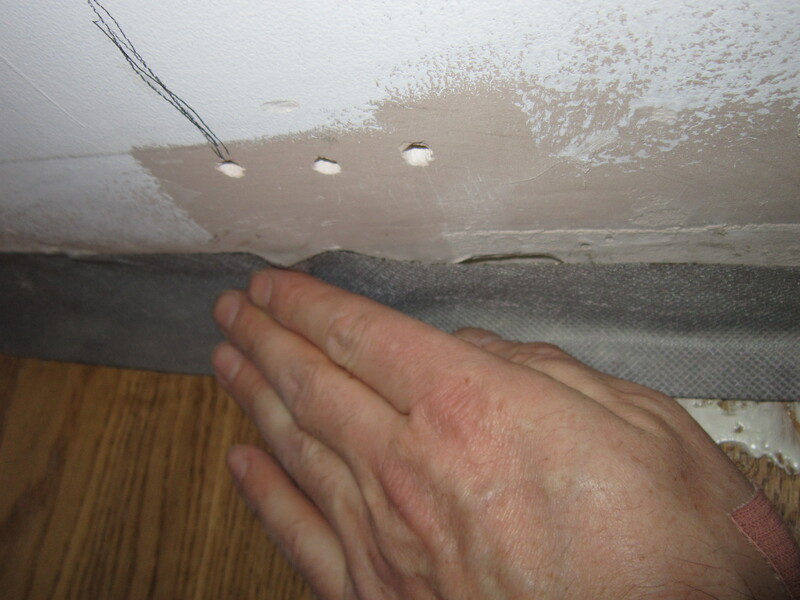 Use expanding foam to seal the gap between the plasterboard and floor covering. In this example we used a tin of expanding foam to fill the gaps behind the plasterboard and between the floor covering and walls. 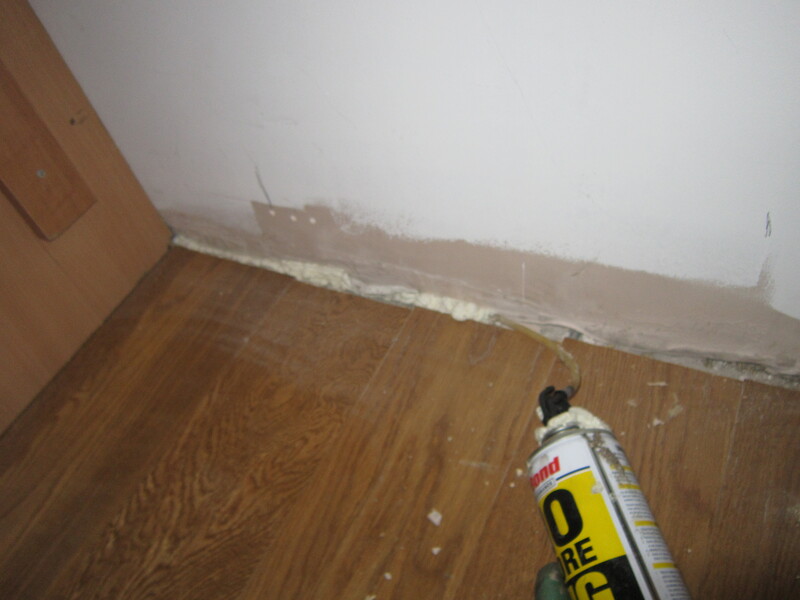 Expanding foam is a handy gap filler but will NOT achieve an Air tight seal alone. Once the expanding foam has cured or the insulation has been packed as tightly as possible, overlap the joint with an air tight tape. In the image above we are using a DAFA split back tape as it has a twin peel back paper covering allowing ease of installation. 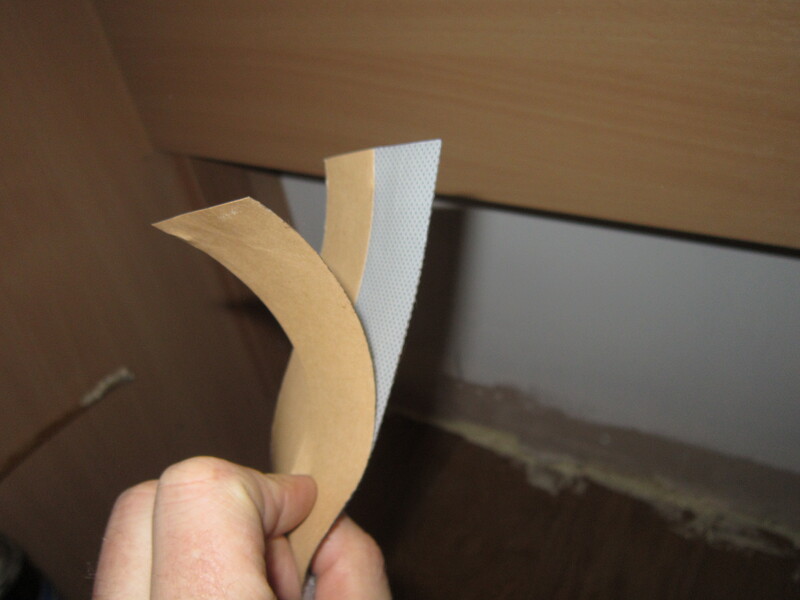 Ensure the tape is not fixed onto the floor where the skirting board edge cannot cover it completely. Once the tape is fitted into position you can replace the skirting boards to cover over the tape and continue decorating the room. This simple upgrade is low cost and has a dramatic affect on the cold air infiltration rates of homes with “dabbed” plasterboard walls or unsealed service drops from cold roof spaces. Having carried this upgrade out on my own home I really noticed a significant difference in the floor temperatures of the property during winter months. Secondary glazing on protected structures and period home upgrades, is it effective? Over the past few months Evolved Energy Solutions have been busy working on energy audits for a number of protected structures and period dwellings. Generally speaking these properties and others from a similar era have a limited number of fabric upgrades available to them unless the clients are planning a deep energy retrofit solution. One of the greatest sources of heating energy loss in winter and increased summer time cooling requirements comes from these structures old style timber frame, single glazed sash windows. 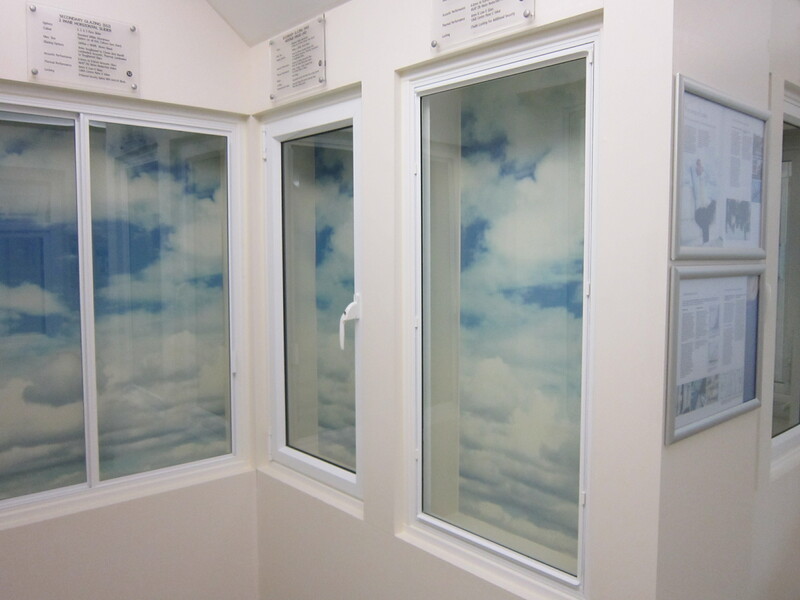 Not only are these units single glazed but they also allow considerable levels of cold air infiltration to enter a property unless they are suitably draft proofed and serviced regularly. Even after draft proofing we find the units to be very poor performance wise in adverse weather conditions. So what should a client do in this situation ? One possible energy upgrade solution is the installation of secondary glazing. 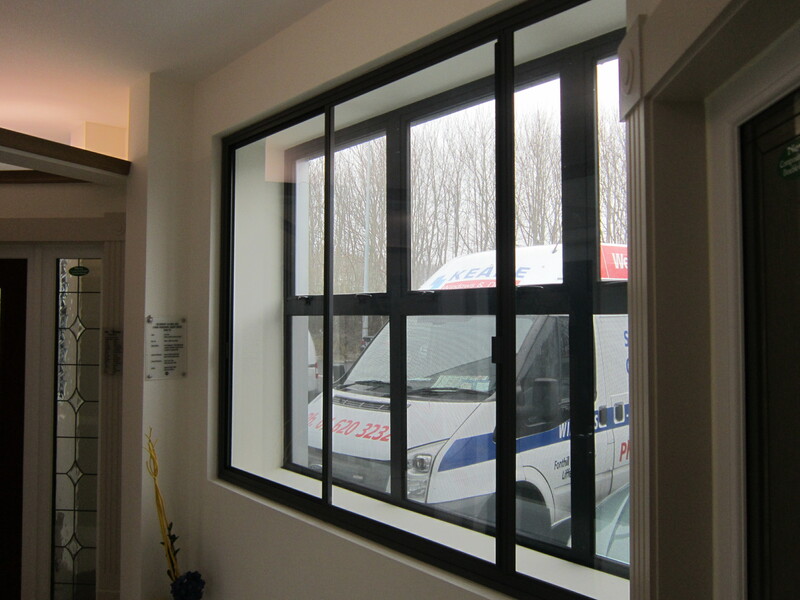 Secondary glazing is when a separate frame and glazing unit is installed within the same opening as the original window unit. 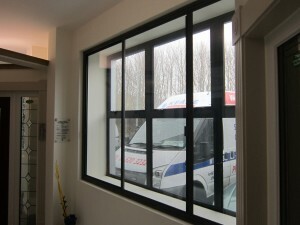 They allow occupiers to install modern energy efficient window systems while leaving the protected single glazed units untouched. This week we decided to visit an Irish supplier and installer of secondary glazing called http://www.keanewindows.com/secondary-glazing.html to test their secondary glazing products functionality and performance with our own survey test equipment. 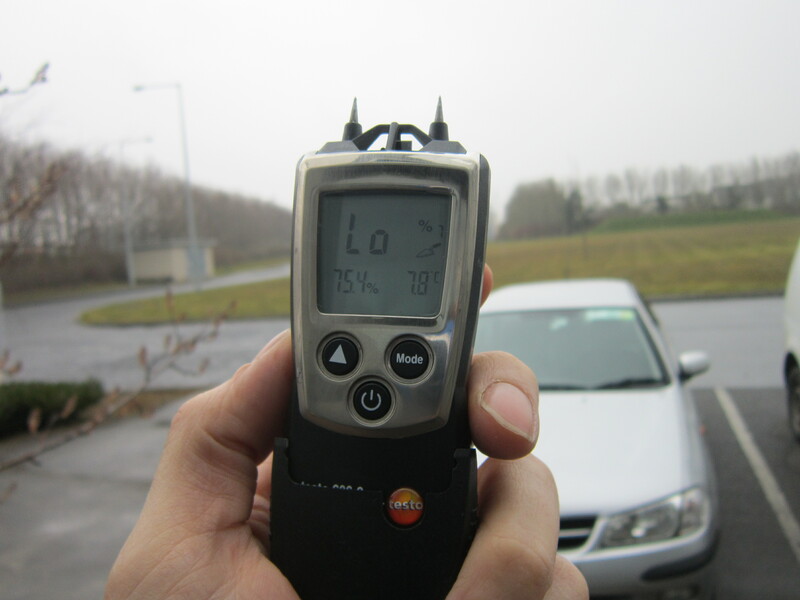 The simple test we carried out was a straight forward temperature measurement survey. The external air temperature on the day was roughly 7.8 degrees. 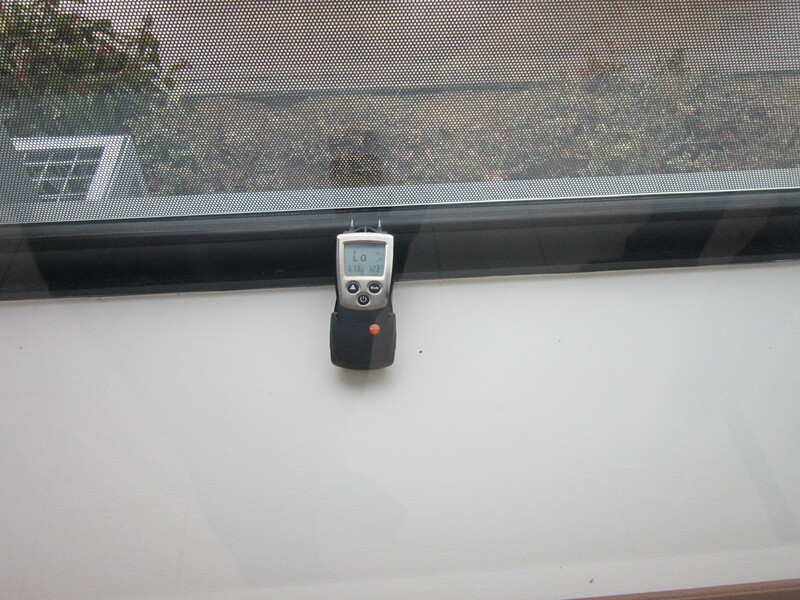 We then measured the air temperature of the space between the original glazing units and the secondary glazing system which was 12.3 degrees a difference of 4.5 degrees. Finally we measured the temperature difference on the internal side of the secondary glazing and came out with a result of 17.7 degrees. 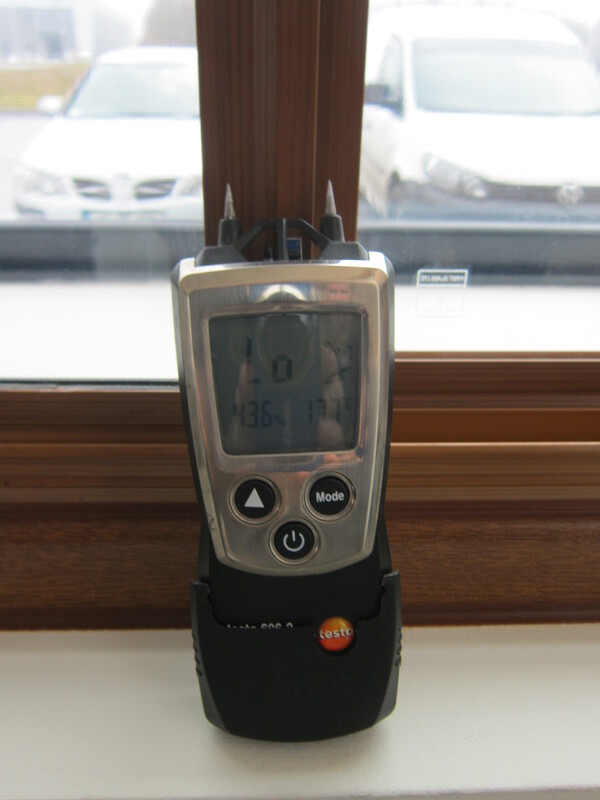 Although there are a number of variables which we are ignoring for this simple test procedure we were genuinely impressed with the 5.4 degree temperature difference found between the original and secondary glazing units. In our opinion secondary glazing could prove to be a very effective energy efficiency and thermal comfort upgrade in period buildings. A2 Building Energy Rating renovation project of a 1900s family cottage in Kildare. 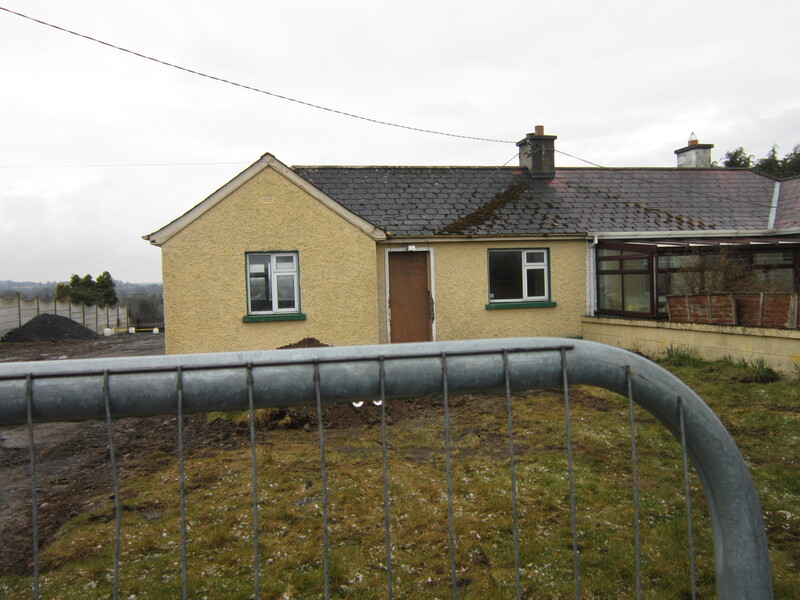 Evolved Energy Solutions have begun work on the residential energy renovation project below this week. As the appointed energy consultants for the job we have provided a guideline specification document for the client to use during the construction process. 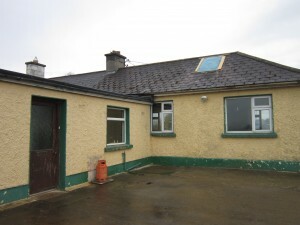 The property is the historical family home of Mr. Glen Lee in Naas Co. Kildare. The end goal is to take this small two bedroom cottage and turn it into a modern four bedroom “A2″ Building Energy Rated family residence. Thankfully the client Mr Lee is an experienced heating contractor http://www.leeheating.ie/ who has a strong grasp of the difference between a good energy rating and an energy efficient low running cost property. We have worked with Lee Heating on a number of residential projects over the past few years and it a pleasure to be involved in their personal home building project also. To achieve the clients goal of reaching an “A2″ Building Energy Rating we have in conjunction with Mr Lee designed the mechanical services to work on a combination of Air to Water heat pump, solar thermal heating and hot water, wood burning stove and a full mechanical ventilation heat recovery system. The property will achieve a minimum air tightness level of 1M³/(h.M²)@50Pa which we intend to achieve through a mixture of DAFA air tightness materials and good construction techniques. Evolved Energy Solutions will provide a quality control air tightness test at a mid stage of construction to ensure we are on target. As you can see below Mr Lee has gone to the extent of removing all the original existing floors and all external wall surfaces will be upgraded internally. The only original features to be retained are the existing roof timbers and external front elevation walls. We will be dropping in to assist Mr Lee in this renovation project over the coming months and will keep updating his progress on our Blog. If you have any questions about the house please feel free to add a comment !. We were back visiting Glenn and his A2 Building Energy Rating home extension / renovation project this month and were delighted to see the steady progress he is making. The property now has the new windows and door frames installed throughout and is ready for the insulation, first fix plumbing heating and electrical to be installed. After that its time for the air tightness membranes and additional warm board insulation to be installed. 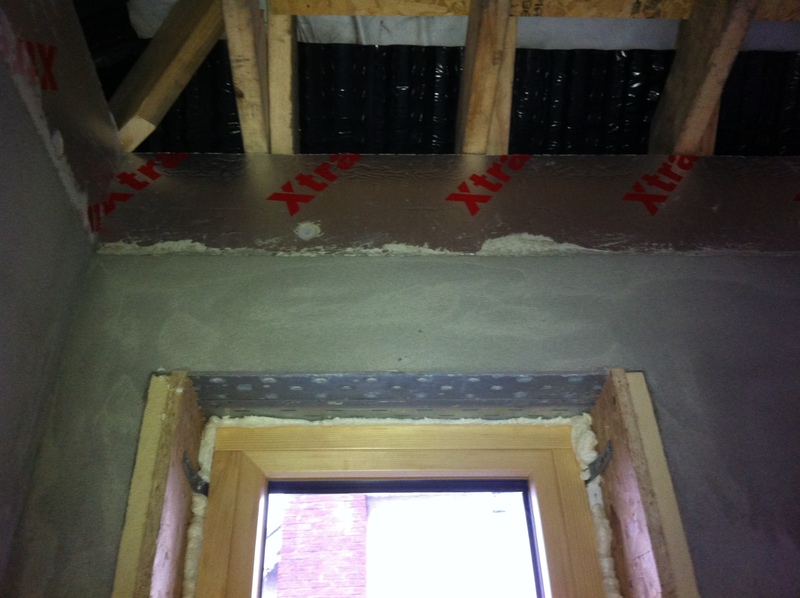 As the image above illustrates Glenn has used a rigid sheet of insulation to internally insulate the property against cold bridges generally associated with older buildings. This application of a rigid insulation material will dramatically improve the heat up rate of the property and associated heat loss. Using a thin foil insulation Glenn has thermally broken the stud partition walls throughout the property. 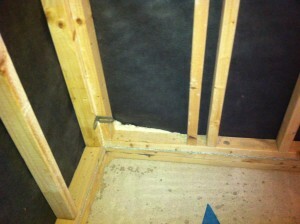 A layer of foil insulation was placed between the stud partition walls floor plates and stud frames. 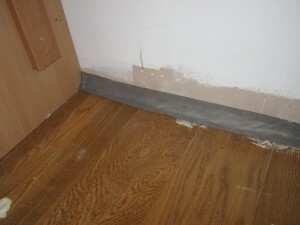 This will lead to a quicker heat up rate on the under floor heating system when in operation. All mechanical services located outside the property will be pump and wired in highly insulated duct work ensuring heat loss is avoided where possible. We will be dropping back down to keep an eye on this project within the next 3-4 weeks and hope to see more good quality work by Glenn! 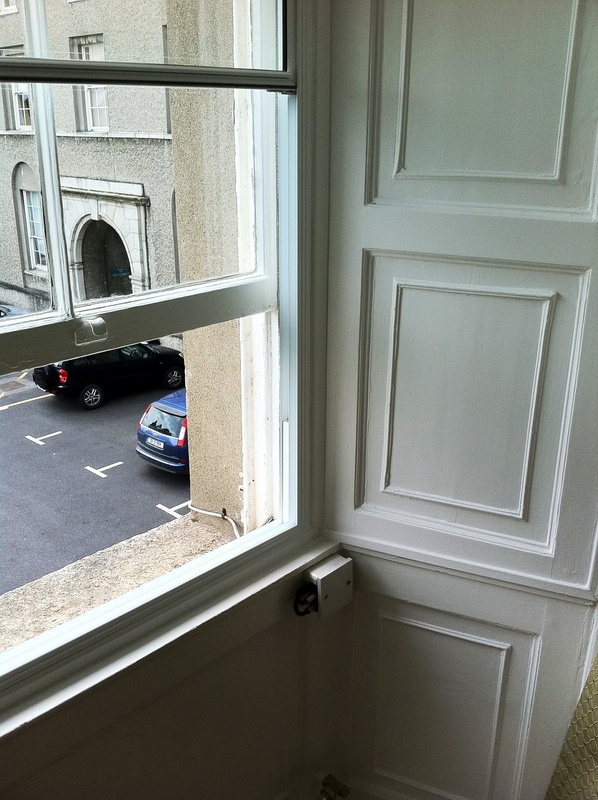 Over the past 4 years Evolved Energy Solutions have tested the air infiltration levels of over 100 residential buildings and several commercial buildings across Ireland. The majority of those tests were carried out on privately owned homes and businesses where the owners wanted to understand why they have very drafty, uncomfortable or expensive to heat buildings. 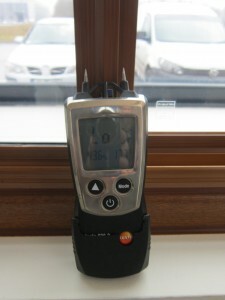 An air pressure test is one of the most effective methods available to the energy consultant to pinpoint where the cold air infiltration points are located in a building. Put simply air infiltration is the uncontrolled flow of air through gaps and cracks in the fabric of a building. This is not to be confused with ventilation, which is the controlled flow of air into and out of a building through purpose built ventilators that is required for the comfort and safety of the occupants. Prior to 2008 there were no guidance levels applicable to Irish dwellings or commercial buildings. This meant buildings could be constructed as drafty as the construction firm liked!! We have found that even well insulated and professionally built homes can still be very drafty due to poor decisions made at the early design stages of a project. 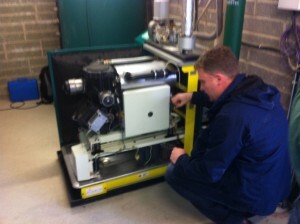 Evolved Energy Solutions use a 3 stage Infiltec blower door rig to test the buildings we survey. The image below illustrates how the rig looks when positioned in a doorway during a test procedure. The fan is very versatile with a large capacity for modern commercial testing applications and easily scaled down to test even a 1 bed apartment. 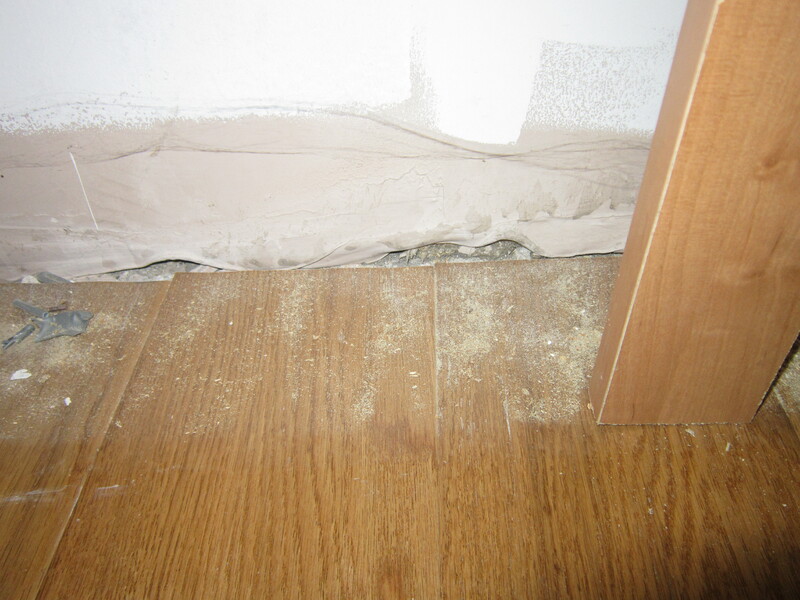 Too much air leakage leads to unnecessary heat loss and discomfort to the occupants of buildings from cold drafts. Our Blower door rig software can estimate the additional volumes of heated air your building is likely to require each day to overcome the unwanted levels of air infiltration we measure. This is a great tool for calculating return on investment figures for recommended repairs and upgrades. If your considering a deep energy retrofit or building a new commercial / residential property check out this video on how to apply our air tightness system and ensure you don’t end up with a drafty or non-compliant building on your hands! 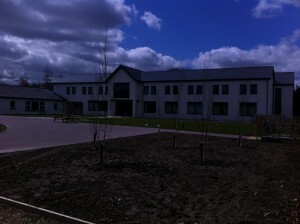 What “value” can a potential tenant get from their Building Energy Rating (BER) ? 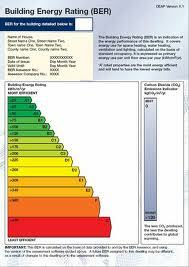 As an SEAI registered Building Energy Rating Assessor, I am often asked what the “value”of a BER actually is. If your selling the property the answer is pretty straight forward, the better your BER rating the more attractive your property should be to prospective purchasers or tenants. If there are two or three houses for rent or sale on the same road I know I would look to rent or purchase the one with the best energy rating available as it should in theory mean savings in the long run. As a prospective tenant or purchaser of a property a BER certificate offers you a visual indication and outline guidance document as to the likely upgrades you may wish to request or install yourself prior to moving in. When you inspect your BER Certificate, pay attention to the black indication arrow which has the Energy Value in kWh/M2/yr directly beneath it. Once you have this figure it is a straight forward calculation process for you to estimate your potential annual energy costs associated to the property. Do not put complete faith in the BER as a definitive or 100% accurate method of calculating your properties precise energy costs. Remember it is only a visual inspection and no quality control testing is implemented during the survey process. Many aspects such as the quality of workmanship, continuation of insulation, air infiltration design and heating system suitability are ESTIMATED and ASSUMED !! Couple the BER with your own inspection of the property and if in doubt get a second opinion. I would particularly recommend this if you are considering the purchase of a large residential or commercial property with more complicated heating and electrical systems. This is where energy prices are going to be substantially higher than your typical 3-bed semi detached home. My final word on the potential value a BER can offer you? It is a great bargaining tool when it comes to agreeing a sale price or long term rental agreement. Even a negative BER result can be turned into a positive when the detail is understood comprehensibly.